In this work, highly chemiluminescent magnetic mesoporous carbon with yolk-shell structure was synthesized by encapsulating N-(4-aminobutyl)-N-ethylisoluminol (ABEI) and Co2+ into the magnetic mesoporous carbon composites (Co2+-ABEI-Fe3O4@ void@C). The synthetic Co2+-ABEI-Fe3O4@void@C showed a good magnetic separation property, which could remove residual ABEI molecules and Co2+ in less than 3 min under an external magnet. Moreover, the synthetic Co2+-ABEI-Fe3O4@void@C demonstrated good chemiluminescence (CL) property and good stability when interacted with alkaline H2O2 solution. The CL intensity of such Co2+-ABEI-Fe3O4@void@C was about 120 times higher than that of ABEI-Fe3O4@void@C. The Co2+-ABEIFe3O4@ void@C also exhibited good electrochemiluminescence (ECL) property in alkaline solution. 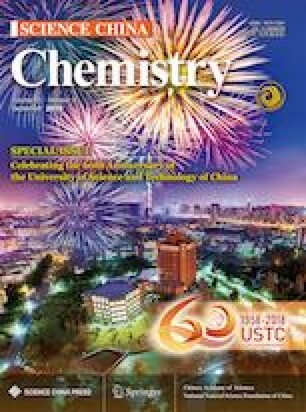 The outstanding CL/ECL performance of the Co2+-ABEI-Fe3O4@void@C was attributed to the Co2+ immobilized in the Co2+-ABEI-Fe3O4@void@C, which catalyzed the decomposition of H2O2 to generate O2•− and HO•, expediting the CL/ECL reaction. The synthetic Co2+-ABEI-Fe3O4@void@C may be of great application for the development of new methodologies in bioanalysis. Supplementary material is available for this article at https://doi.org/10.1007/s11426-018-9329-5 and is accessible for authorized users. This work was supported by the National Natural Science Foundation of China (21475120, 21527807) and the National Key Research and Development Program of China (2016YFA0201300).